Do you have an amazing camo or installation idea you'd like to share with the Farmily? A theme camp is a great way to express yourself and facilitate creativity at the festival. Each year Shambhala Music Festival accepts theme camp applications from our ticket holders who'd like to contribute to the festival. If you're interested in creating a theme camp please read the important information below. Theme camp applications for 2019 will open March 15. Successful applicants will secure reserved, prime camping along the main thoroughfare to share their offering with the Shambhala community. Proposed layout and use of space, number of vehicles, and number of personal tents / trailers. All applicants must submit a drawn layout of their proposed theme camp, so start working on your application now! To ensure a positive experience for all guests, we have created the following guidelines, terms, and conditions for our theme camp operators. By applying for a position within our theme camp area, you agree to comply with the following conditions regulating theme camps. Theme camps found to be not in compliance with the following requirements may be removed from the theme camp area. Extreme cases may result in camp operators being removed from the festival grounds. Review the Banned Items FAQ on the Shambhala Music Festival website prior to applying. Your theme camp area may not contain any banned items. Prohibited items will be confiscated, and further consequences may apply. 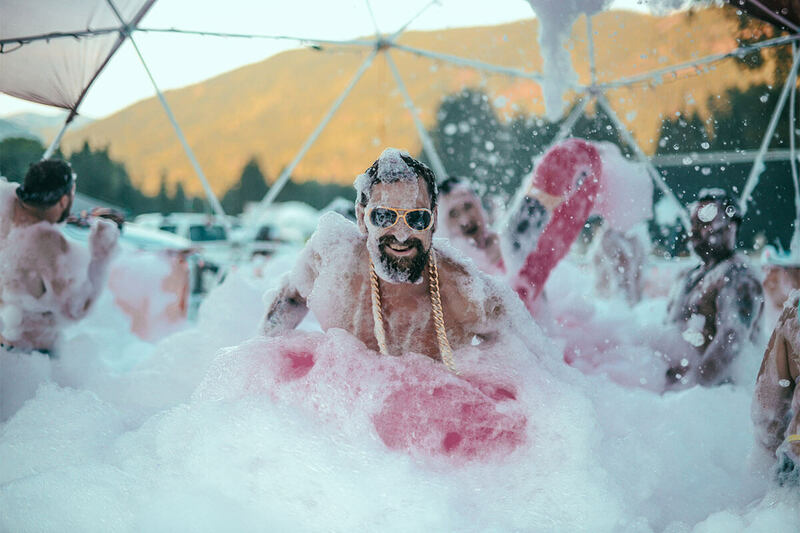 Shambhala Music Festival and the Salmo River Ranch are not liable for guests who injure themselves on the festival grounds, or within your camp area. It is your responsibility to ensure that any installations within your theme camp do not pose a safety risk. In the event a Shambhala staff member reports a safety hazard or deems any installations within your camp to be unsafe, you will be responsible to secure or remove the installation immediately. Loud music is prohibited. Theme camp operators must limit the volume of any music played within their camp zone. Generators, sound equipment, and “Renegade stages” are not permitted within the theme camp area. Ensure that any prefabricated theme camp shelters or structures can be constructed without the use of banned items. Keep in mind that many tools (axes, hatchets, hammers, saws) are considered banned items. Shambhala Music Festival is unable to lend equipment or tools to guests and ticket holders. The theme camp area is in the direct proximity of buried electrical lines and other infrastructure. It is extremely important that camp operators obey the ticket holder agreement and do not dig any holes, or use tent pegs longer than 12 inches in length. If your camp specifically requires larger pegs for guide wires, please indicate this on your initial application so we can accommodate you. Last minute requests on-site will not be facilitated. Unauthorized commercial vending on the festival grounds is strictly prohibited, including in theme camp zones. Anyone found to be selling anything without written authorization from the festival will be ejected from the festival grounds. Theme camps are encouraged to create signage for their camp allowing guests to find and interact with them. Any signage deemed by Shambhala staff to constitute advertising of a commercial product or service must be removed, or fully covered up immediately. Signage is only permitted within your designated zone. Theme camp operators will not be permitted entry to the festival grounds until Wednesday, August 6th at 8am. Theme camp operators are not permitted to bypass any traffic lanes or holding lots. Upon application approval, the theme camp lead contact will receive a complimentary early entry pass for two to set up the camp. You must submit a sketch of your camping area outlining positioning of common areas, personal tents, and any essential vehicles at the time of your application. Due to limited space, we encourage you to have as few vehicles as possible at your site. No parking is provided for additional camp vehicles within or around the camping area. We encourage our ticket holders and camp operators to park extra vehicles in the Free Parking lot. Any significant changes to the initially submitted camp layout must be confirmed and authorized by your theme camp liaison by no later than July 15th. Theme camp operators whose camps differ significantly from approved designs may be asked to vacate the theme camp area. Approval was given based on the presence of a specific art or community installation, but the installation is not present. Having more vehicles in the camp area than what was approved. Changes to overall camp size or footprint. Reduction in communal space due to presence of more personal tents or campsites. In the event of cancellation, we ask that you contact your Shambhala liaison immediately so they can attempt to find an adequate replacement. Operators are not permitted to sublet or contract their theme camp area. Changes to theme camp ideas or points of contact must be approved in writing by your Shambhala liaison. You are responsible for ensuring appropriate oversight and supervision of your camp area during the festival. Members of our staff will occasionally visit our theme camp area to ensure the camp area has a level of supervision appropriate for the activities contained within the theme camp. Camp operators are encouraged to collect experiences, stories, and photos for inclusion and sharing on our social channels. If those aren’t skills you personally possess, you are welcome to visit the Press Tent and connect with Press & Media who are documenting Shambhala. Shambhassadors will be available during load-in and at BASScamp throughout the festival to assist theme camp operators who have questions or require additional information. As roadways may interfere with your desired theme camp layout, your camp may need to be adjusted upon arrival to accommodate roads or pedestrian pathways on the festival grounds. Our traffic control teams will assist you upon arrival if your camp will need to be reconfigured to meet the requirements of the area. All theme camps must close to the public no later than noon on Monday, August 12, 2019. Theme camp operators are required to remove all camp items and must “leave no trace”. 10/07/2019 - Welcome package and entry instructions delivered by email to approved theme camp operators.